Senior Kevin Malo will lead one of NIAA’s top rushing attacks into the Class 3A Northern League semifinals on Saturday, Nov. 3. 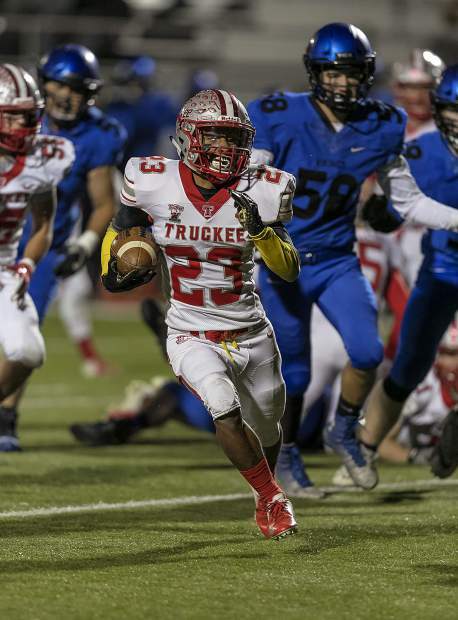 After an 8-1 run through the Class 3A Northern League, Truckee’s football team is a win away from returning to the state playoffs for the first time since winning the state championship in 2012. The Wolverines enter this year’s Northern League tournament as the No. 2 seed, which gave the team a first-round bye, setting up an eventual matchup with No. 6 seed Lowry at home on Saturday, Nov. 3. Lowry (6-5, 4-5 Northern League) enters the game after pulling off a 41-13 upset last week on the road against No. 3 seed Elko. The Buckaroos’ win came two weeks after suffering a 42-13 loss at home to the Indians. Lowry will now head to Surprise Stadium this weekend looking to shock another higher seeded squad. The Buckaroos tested the Wolverines earlier in the season, falling 27-10 at home in a game that Truckee led by two points going into the fourth quarter. Lowry has several players that can run the ball, but primarily relies on the playmaking of senior quarterback Brendan Domire, who burned the Elko defense on several occasions last week. The team also returns running back Anthony Peterson from injury. Truckee’s own dual-threat quarterback, senior Marcus Bellon, enters the game sporting one of the best stat lines in all of the Nevada Interscholastic Activities Association with 1,412 passing yards and 16 touchdowns, along with 290 rushing yards and eight touchdowns, and 53 receiving yards and two touchdowns. Senior Kevin Malo leads one of the state’s most prolific rushing attacks with a team-high 564 yards. Malo is one of seven players with 200 rushing yards or more this season. Senior Marcus Trotter has tallied a team-high 278 receiving yards for Truckee, and senior Drew Wingard leads the defense with 96 tackles, including 18 for a loss. Trotter and Wingard have combined for nine sacks on the year. Truckee will also have senior defensive lineman Chance Bordner suiting up for the first time this season after returning from injury. The Wolverines and Buckaroos are set for a 1 p.m. kickoff at Surprise Stadium on Saturday, under what’s forecasted to be cool weather with little wind for the semifinal round of football.